Each year I make a wish list of cool toys for the kitchen that I would love to find under the tree Christmas morning. It’s sort of my Dear Santa letter that I send this time of year. I’m not sure Santa is checking out The Reluctant Gourmet, but if he is, I hope he sees this post. If you have a “foodie” in your home and you’re looking for some gift ideas, maybe you’ll find something here that looks interesting. My daughter’s college roommate brought one of these to college for their dorm room and they both rave about the quality of the coffee and latte’s they make before heading out for class in the morning. I took my daughter to Starbucks for a latte while she was home for Thanksgiving and she told me their Nespresso makes better coffee drinks than Starbucks. Hard to believe but I think it’s worth a try. This unit with the milk frother is on sale at Amazon at $161. The coffee capsules cost $1.10 and espresso capsules $0.85 at the Nespresso website. I’ve searched and it would seem they have the best prices for all their capsules. So I’m figuring if I purchase a $4.50 venti latte 3 times per week, it would take me just 12 weeks to pay for the machines minus the cost of the capsules and milk. But I so love getting out of the house in the morning for coffee with friends. Tough call here. If you are going to have the machine, you might as well ask Santa for the pods too. Nespresso calls them “capsules” but most people are calling them “pods”. 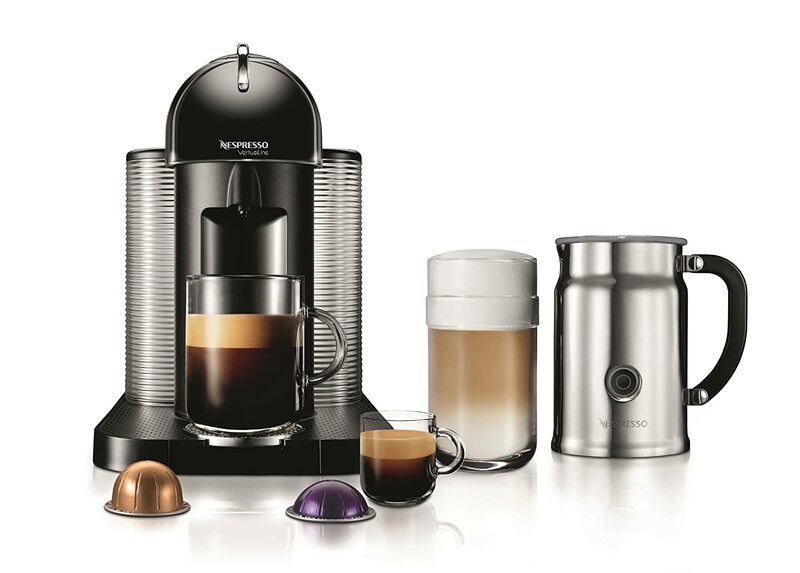 From every place I’ve looked online, the best and cheapest place to buy these Vertuoline pods is on the Nespresso website. When you go there, you’ll find you are able to choose 12 different coffees plus 3 Limited Editions including Pumpkin Spice, Gingerbread and Banana Bread. Then there are the espressos. There are 4 espresso with names like Diavolitto, Altissio, Voltesso and Decaffinated Intenso. You can choose you different coffees and espressos by Intensity and whether they are Balanced, Fruity or Intense. From the looks of it, you have a lot of choices and the pods look really cool. I was reading this review about a different knife that was funded by Kickstarter and the reviewer who sounded like he knew what he was talking about mentioned this Kyocera ceramic knife as his favorite. Why? Because it require very little maintenance and stays sharp for years. He says he’s owned one of these knives for over ten years, has never sharpened it and it still performs like new. I have never owned a ceramic knife and I’m not sure why. I know they have limitations including they break into pieces if you drop them. You can’t cut through bones or carve pumpkins with them and they might chip or crack but they are light, comfortable in your hand (according to the reviewer) and are very, very sharp. This knife is on my list and I can’t wait to give it a try and write my own review. I looked it up at Amazon and it’s selling for $42, down from $69.95. The write-up says it is “totally impervious to acids, juices, oils, salts or other elements; will never rust and your kids won’t touch it.” That’s not true. The last part was my wishful thinking. The other knife the above reviewer raved about was this Japanese chef’s knife from Mac. He said it is a great starter knife that will stay sharp for years with minimal care. I’m always a little skeptical when people or companies say the knives don’t have to be sharpened for long periods of time. I can see it with a ceramic knife, but in my experience, most steel knives need to be sharpened. So it is on my Santa list and if I’m lucky enough to find it under the tree, I’ll give it a test ride and let you know the results. According to Amazon, it is selling for just under $50 bucks which is a great price when you compare it to some of the more popular high-end knives like Wusthof or Henckels. The write up does say, it is made from “rust-resistant metal, is exceptionally sharp, and made out of high carbon Molybdenum steel and keeps an edge for a long time.” And I like that it has 4.3 out of 5 stars from 39 customer reviewers. I already own a much simpler handheld version of this Veggetti Spiralizer that works great but if you are going to make a lot of veggie pasta, this is the way to go. I have a friend on Facebook who has one like this and says they are perfect for both large and small amounts. We have a joke in our house. My wife doesn’t want me to buy her any more kitchen appliances that can be “plugged in”. Well, I don’t see any plug on this gadget. 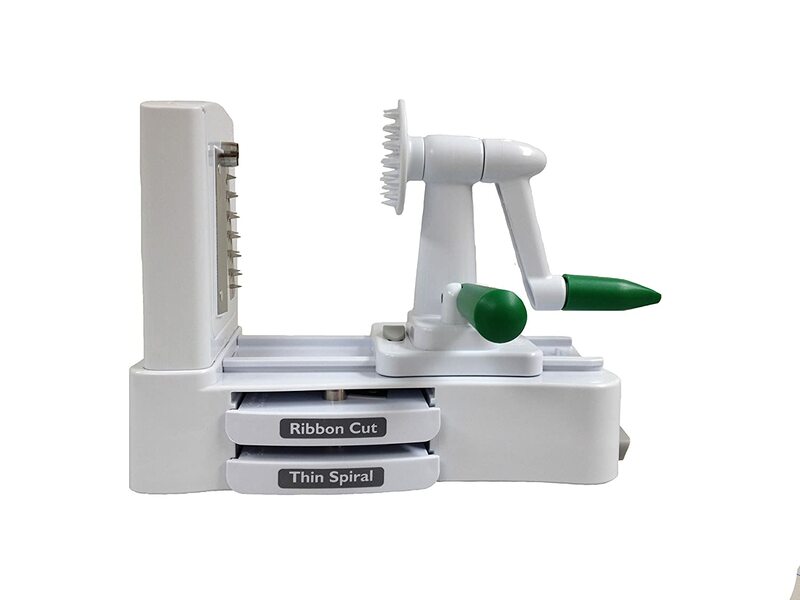 The Veggetti Pro Table-Top Spiralizer comes with 3 interchangeable stainless steel blades that will cut thin, thick & ribbon pasta cuts. It has a suction cup built into the bass to prevent slippage. Perfect for making pasta out of zucchini, carrots, cucumbers, squash and potatoes. I already have a food scale that works fine but it’s well over 10 years old and is held together with duck tape so that’s why I’m putting this highly regarded scale on my list. I’ve never been one who does a lot of weighing and measuring ingredients but now that I’m on a diet counting calories, I find myself gently pulling it out of the cabinet to weigh what I’m about to eat. Not fun but necessary if I’m going to shed a few pounds. 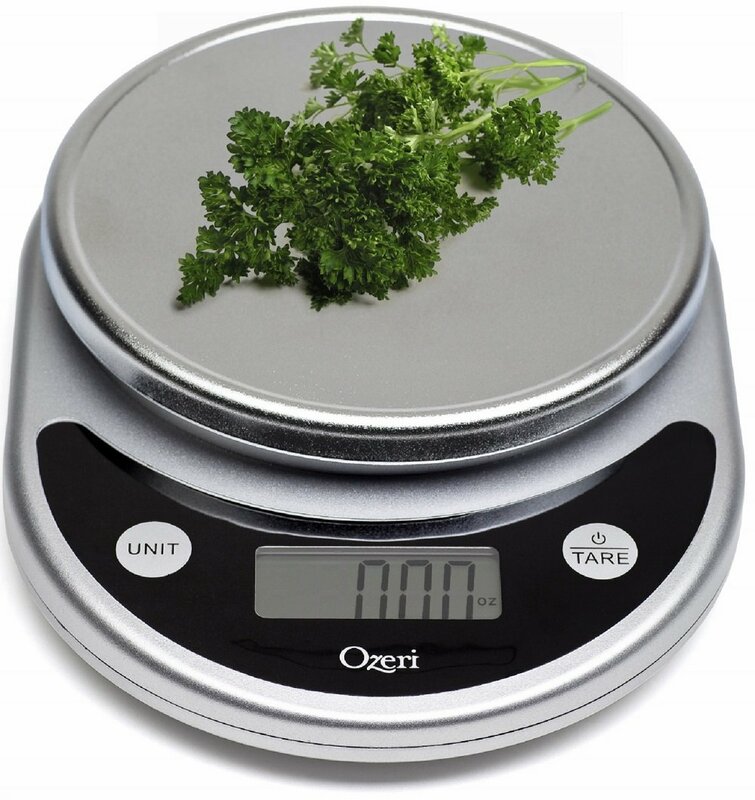 This Ozeri model can weigh up to 11 pounds in precise graduations of 0.05 ounces or 1 gram. It runs on 2 AAA batteries and has an “Automatic Unit Button” that instantly converts ounces to grams or pounds to kilograms. When checking the reviews on Amazon, I noticed a lot more people are dieting like me and then there were a bunch talking about using the scale for weighing illegal substances. Why would you post that anyway? The reviews were good but better from the non-drug dealers. I wonder what that tells you? When looking for items to put on my Santa Wish List, I came across this interesting looking dough whisk and immediately was pulled in because of “The Original Danish” part of the title. My mom was from Denmark so I have an affinity to all things Danish. Then I noticed it had a 5 star rating on Amazon and that’s from 1,193 reviewers. They all can’t be paid reviews or can they? It has a professional grade stainless steel whisk that is supposed to be easy to clean but I really like any tool that has a wooden handle. Makes me feel like I have a real substantial tool in my hand. 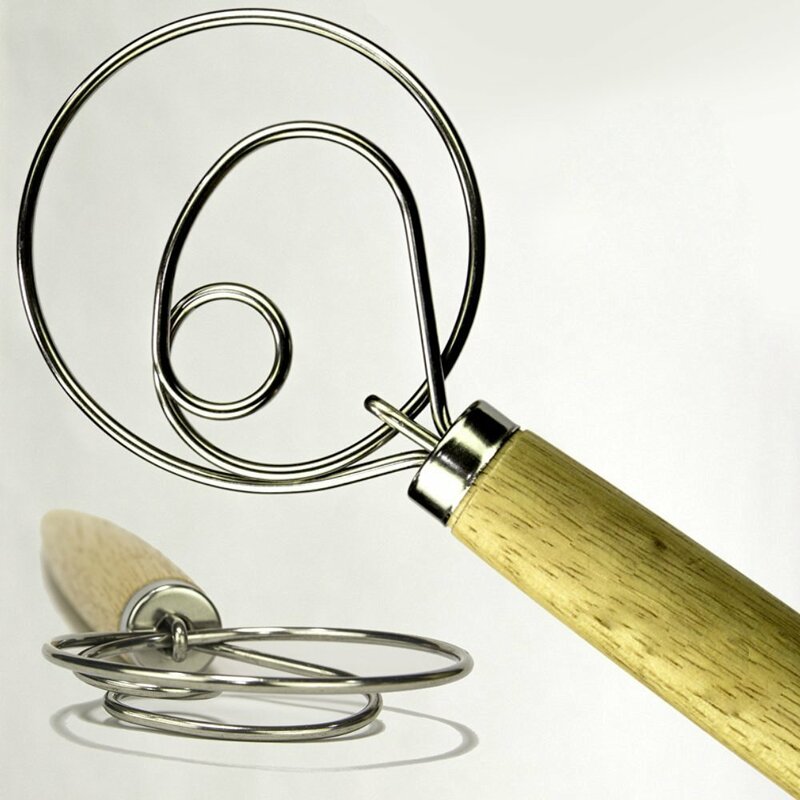 What can you do with this interesting looking dough whisk you ask? Make dough of course and that includes pizza dough, pasta dough, bread dough, pie dough plus it only costs $9.99 at Amazon right now so it will save you some dough.